MuckMat - Muck Prevention, Removal, and Control - Good Bye to Muck & Weeds! Good Bye to Muck & Weeds! Because no one likes getting stuck in muck! 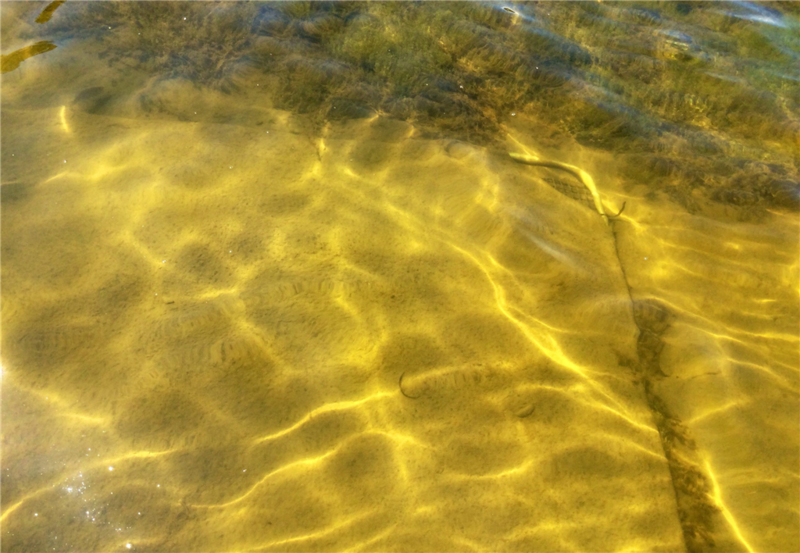 The MuckMat creates a firm surface on your lake bottom that is easy to walk on so people do not sink into the muck. Once the MuckMat has been placed in the water, an immediate change is visible. Individuals who walk on the MuckMat will find that they no longer sink. Instead, they can walk across the area with ease. 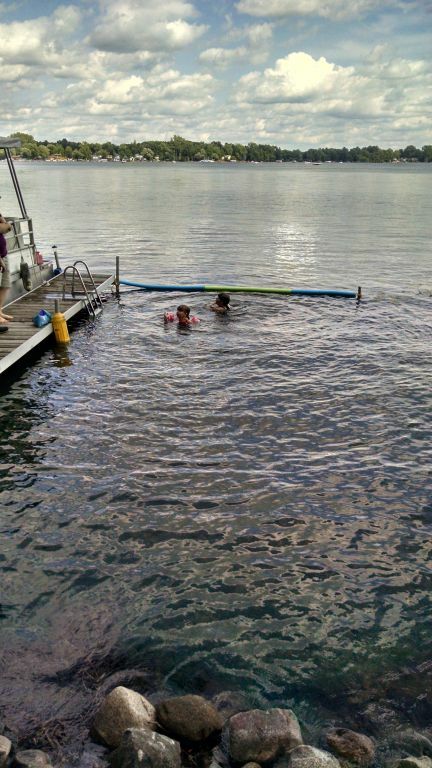 The MuckMat provides a supportive barrier between an individual and the mucky lake floor. The MuckMat does this by spreading the individual’s weight across the entire mat area to prevent them from sinking into the muck. It’s a great combination that uses simple scientific facts to create a solution to your muck problems and it is an affordable, effective and safe alternative to costly lake muck removal services. In addition is also kills all the aquatic weed plants below it so you not only do not sink anymore, you do not have to get tangled up in weeds as you swim in the lake. And for your piece of mind, the MuckMat is DEQ approved and guaranteed for five years against defects in materials and workmanship. MuckMat Pro is the only lake muck control product that lets you walk over muck — without sinking! 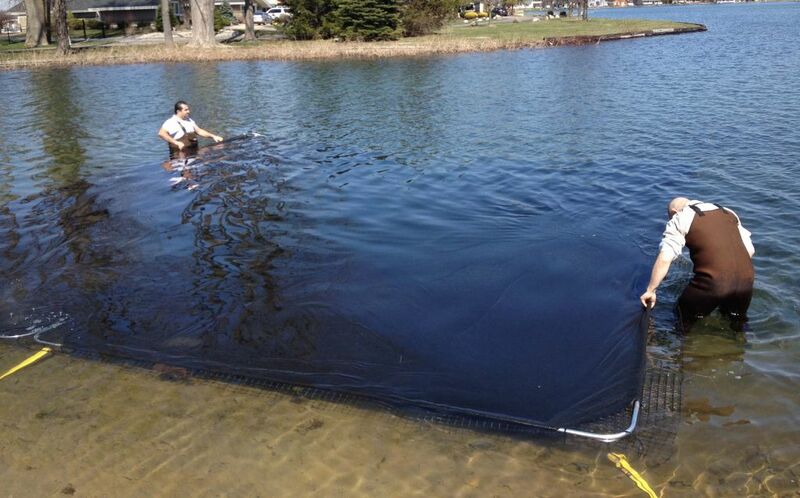 It is the simplest, safest, quickest, most effective way to handle lake bottom muck. Nothing compares — or even comes close. See for yourself — MuckMat Pro is Unique! Awesome video isn’t it? That muck is very soft. A soil engineer said it has, “zero bearing load capacity.” That’s super bad muck — and you just watched me walk right over it! (You probably noticed in the video, there weren’t any lake weeds either). Guaranteed to work — Because it does! Made in Grand Rapids, Michigan, USA! If you’ve driven on I-75 in Florida, the Alaskan Highway, or thousands of other American roads — you’ve driven on the technology MuckMat Pro uses. Highway engineers use special fabrics and grids, designed to hold sand and gravel securely over soft, wet soils — providing a solid base for the concrete surface you drive on. MuckMat Pro uses these same fabrics and grids. You walk on the fabric — the grid underneath holds you up. A rugged, steel frame keeps everything in place on your lake bottom. When you step in muck or mud, you sink because the soil actually moves sideways — not down. Gravity pulls on you — the wet soil slides to the side (most of it) — and you sink in the muck. Yuck! You’ve probably had this happen. You step in mud — and the mud moves sideways, then up and around your shoe. The MuckMat Pro prevents the muck from moving — and you don’t sink! 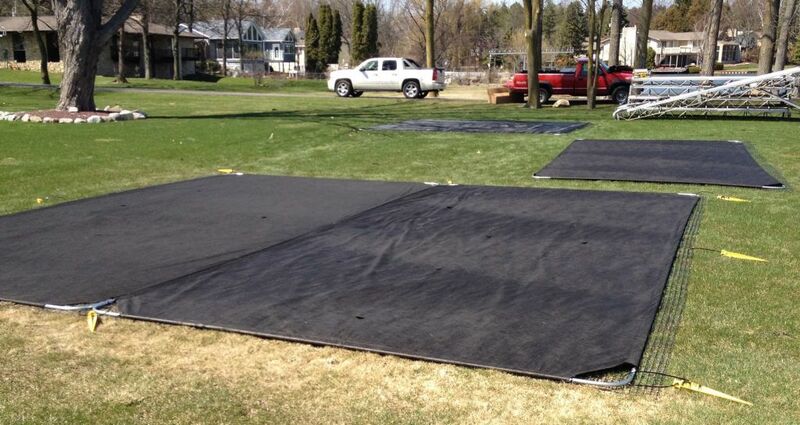 Many people use multiple MuckMat Pros to create larger beach areas — often adding sand on top. 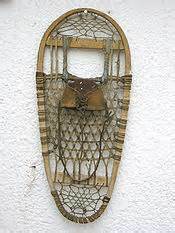 Think of a snowshoe. You know it transfers your weight over a larger area, helping you walk over deep snow. But a snowshoe's webbing also traps snow crystals, locking them in place. The snow can't move sideways — and you walk right over it. Another example. 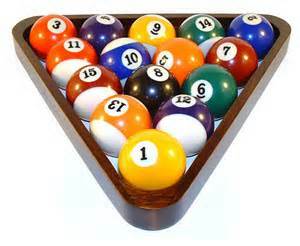 Pool balls roll around freely on a pool table. But when you "rack 'em up," they can't roll. The more balls you put in the rack, the less they can move — and if the rack is full — they can't move at all. That's exactly how our grid works. In this close up of a MuckMat Pro you see the black grid under the steel frame and black fabric. Now you see how it works — it's pretty awesome, isn't it? Like the snowshoe, the grid transfers your weight over a large area. Meanwhile, holes in the grid fill with muck — trapping it — like the pool balls . You walk right over your muck, no matter how deep it is. Now that you've pictured it — you've got a good idea of how it works. Even if you don't see it completely, yet — it works — just like the video you watched. 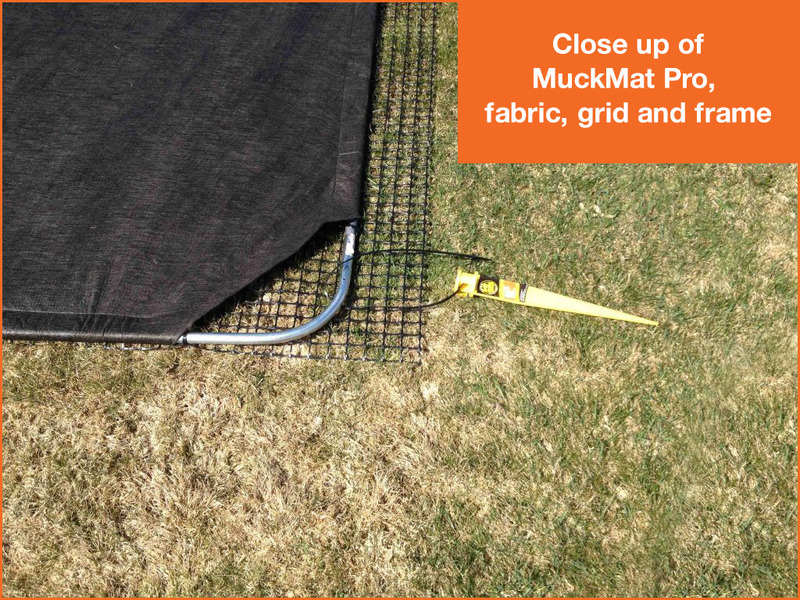 MuckMat Pro is easy to install — Leave it in year round — Put sand over it, if you wish — Guaranteed to work! The MuckMat Pro gives you a firm surface to walk on — and makes a firm base if you want to add beach sand. The fabric also keeps sunlight from reaching your weeds — so you're weed-free! The aluminized steel frame holds everything in place on your lake bottom. Muckmat Pro stays where you put it — it won't move. Now you know how a MuckMat Pro keeps you from sinking in muck and weed-free, (and a little about how highways are built). If you're tired of fighting lake muck and weeds — you've got the solution — MuckMat Pro! MuckMat Pro gives you a firm surface to walk on — and keeps you weed free — Guaranteed! Absolutely! They provide habitat and protection for fish and waterfowl, they’re a food source, they recycle oxygen and carbon dioxide, they help prevent shoreline erosion and filter water particles. They become a problem when there is an overgrowth of aquatic weeds, especially on your beach front. Can I leave my Mat in all year? Yes, I leave mine in all year. You can take them out if you want to, but it's a lot of work and completely unnecessary. Can the Mat be used on top of lily pads to get rid of them? Yes, but lily pads are a tough customer. The best thing to do is cut them back and put one of our Mats over them as early in the season as possible. If they're on shore, you can use a black, plastic tarp to place over them. The idea is the deprive them of sunlight. But they are tenacious! Do I have to put in the plastic stakes? I would. The thing about muck is, it releases a lot of gases in the summer and it moves around easily. The more tension you create over the top of it, the better off you are. Some people don't use all the plastic stakes, but for best results, I'd use them all. Do I need a DEQ permit to install a Mat? It depends on what country, or state you're in, and sometimes, even what county or water body! If you speak with your regulatory agency, you'll want to tell them you're interested in installing a "seasonal benthic barrier." Most areas won't require a permit if it's something you put in and take out like a swim raft. 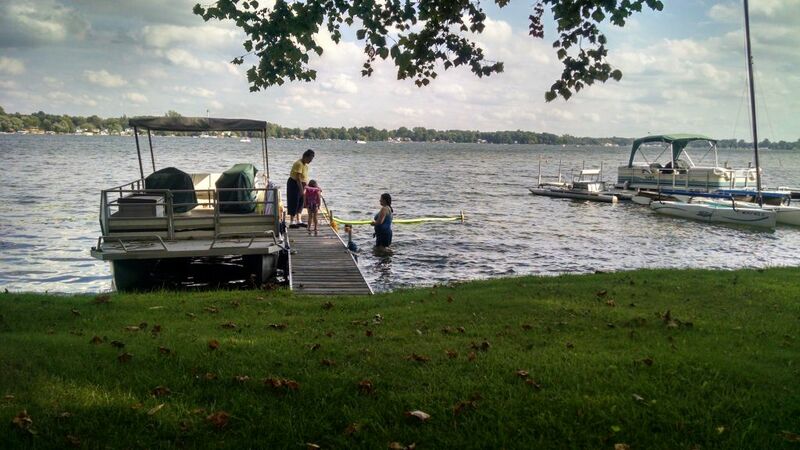 If you're getting a MuckMat or BoatLift-Mat, it's primary purpose is to provide a "seasonal" platform to walk on. Most areas have no policy on lake bottom platforms. Do I need to clean my Mat off? It depends. If you have a lot of foot traffic, (boats, kids and dogs) that will keep sediment from building up. However, once a year or so (depending on how much sediment is floating in the water) you’ll want to sweep it off, blow it off, or if you’re really ambitious, take it out of the lake and wash it off. I don't suggest this last method, but it’s up to you. How are the mats affected by Zebra Mussels? Zebra mussels like structure, like your dock, your boat, or you if you stand still long enough. Our Mats are flat, like the bottom and aren't really attractive to zebra mussels. They move across the Mats, but don't stay there. They'll be about as scarce on our Mats as they are on open, sandy areas. Installation of the mat looks easy in shallow water. How does one isntall it in 8' to 10' depth water? The only simple answer is use either a LakeMat Pro or a MuckMat Pro. The frame will keep it square and cause it to sink. I'd also suggest fastening some type of weights on the four corners to hold it in place until it settles on the bottom... yes, I'd leave the weights on it even after it settles. Is there a risk of the mats ripping from fishing lures? No. That said, if someone is dumb enough to be fishing in shallow, weedy water, with a non-weedless hook, and they're dumber still to let it sink to the bottom and the hook gets stuck in the Mat, they will break their line trying to get it out. Doesn't happen often. At my current cottage, I've had eight Mats in for four years. Over that time I've had one lure caught on one Mat. Just pull backwards, and the lure comes out easily. 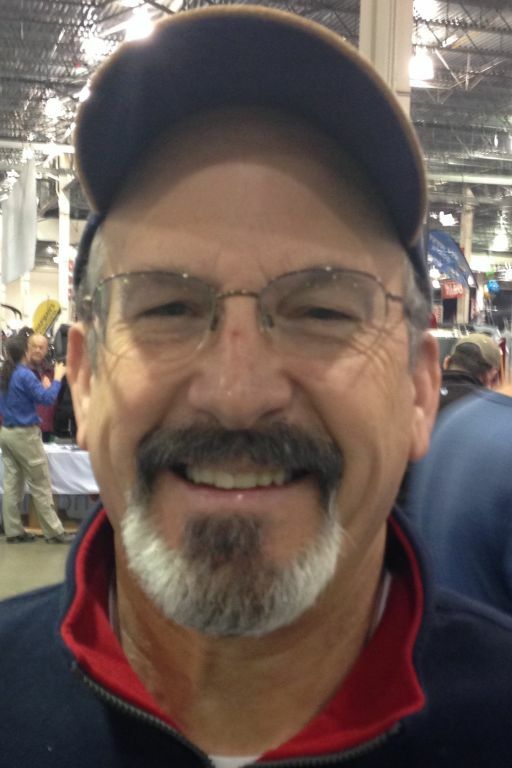 If you have a bumper crop of dumb fishers, you may have more lures to pull out, but it's not likely. To cover a large area, can you attach more than 1 together to cover a wider/longer area? Yes, it's especially easy to connect LakeMat and MuckMat simply by fastening the frames to each other. We had one guy who did 16 Mats! It's common for people to fasten two, three, and four together. When installing, does the mat sink to the bottom or do you need to stand on it to sink? LakeMat and MuckMat will sink by themselves fairly quickly. It may take a few minutes. You can help it along if you wish. Can I put sand over the top of a MuckMat? Yes, but eventually sediment will land on the sand allowing weeds to start growing again. If you have a blower to get the sediment off, while leaving the sand, this will work fine. Or, if you don’t mind adding more sand every couple years, this should work too. Many states however, don’t “cotton” to people dumping sand in lakes, so you’ll need to be cool about this. Can I stand on the edge of a MuckMat? Yes, if you look at the video of me standing on it, I’m right at the edge. Then you’ll see me step off into the muck...Yuck! Does a MuckMat control lake weeds too? Yes, just like the LakeMat®. In fact, a MuckMat® is a LakeMat® with a special material added to the bottom to allow you to walk on muck. 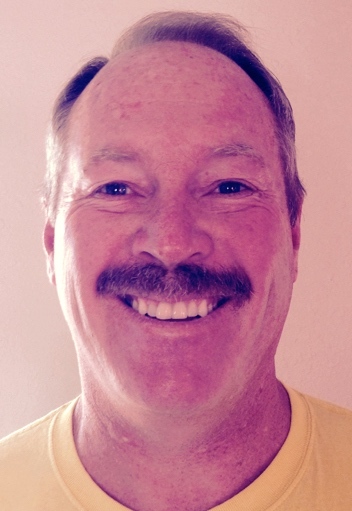 Will lake weeds grow up through the gas release ports? Life is tenacious. So yes, eventually a lake weed or two may grow through the gas release ports, just like grass pushes through concrete on land. However, pulling out a couple small weeds here and there is much better than dealing with a whole beach front full of weeds and muck, isn't it? Does muck "ooze" through the vent holes when you walk on it & then stay on the top of the mat? Sure, a little. Sediment will land on it too. But you'll never sink it the muck again. As I've said elsewhere, just blow or sweep off the sediment that gets on your Mat. Does the muck mat come with the stakes and the rope? Yes, the original LakeMat and MuckMat comes with line and plastic stakes. The new Pro series comes with long zip-ties and plastic stakes. 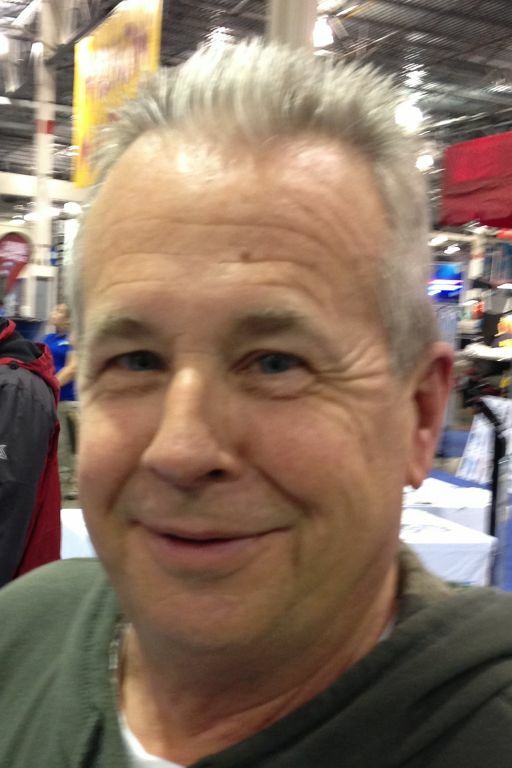 How can MuckMat® help with my soft lake bottom? 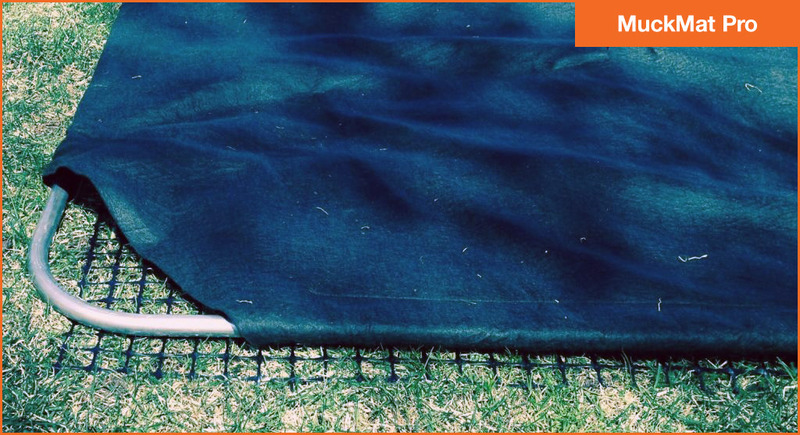 Aside from managing aquatic weeds, your MuckMat® also acts as a tension barrier. Think of it like a snowshoe over deep snow. By dispersing your weight, it holds you up. And, you won’t feel the muck and soft sediment on your feet. It feels something like walking on a felt carpet. How does a MuckMat® work? There are two reasons, (soil control experts will quibble with this, but I’m writing for people with muck problems, not experts) The first reason is, soft soils such as muck, move sideways, or “laterally” if you like big words. When you step in any soft soil, mud, or muck the reason you sink is the soil moves sideways, taking the path of least resistance. Not much soil actually moves down. As the muck moves to the sides it creates space for your foot to sink down, because you’re heavier than the muck. So, the trick is to prevent the soil from moving sideways. That’s what the MuckMat® does. Square holes, or “apertures” if you really like big words, catch the soil as it moves and locks it place. Think of it as a giant snowshoe, it creates a thin veneer of soft soil that can’t move. The second reason (yes, soil experts, I know this is part of the first reason) is weight distribution. Just like a snowshoe spreads your weight across a larger surface, so does the MuckMat®. Think of it this way. When Sir Walter Raleigh laid his coat over a mud puddle so Queen Elisabeth wouldn’t soil her feet, both his coat and the queen’s foot sunk, (no rigidity or tension). However, if he’d put down a sheet of plywood, the queen would have pranced right over it and Raleigh wouldn’t have ruined his coat. A MuckMat® creates a “rigid” surface with its own “tension,” like a sheet of plywood, except it’s fllexible. To recap: a MuckMat® keeps muck from moving, it distributes your weight and provides rigidity to the surface of the soil so you don’t sink in the muck. And that’s why it works. How long will the MuckMat work? As long as you clean it off once a year or so, (sweep it or blow it off) it will last longer than you will. Even if you never clean it off, you won't sink in the muck ever again. We guarantee the material for five years, but that's very conservative. The fabric manufacturers project if it received no UV light whatsoever, it will last 20,000 years. So if we go with just 1% of that, it should last much longer than we will. Now our grandkids can enjoy the lake shore as it's meant to be. We'll be getting two more this spring. 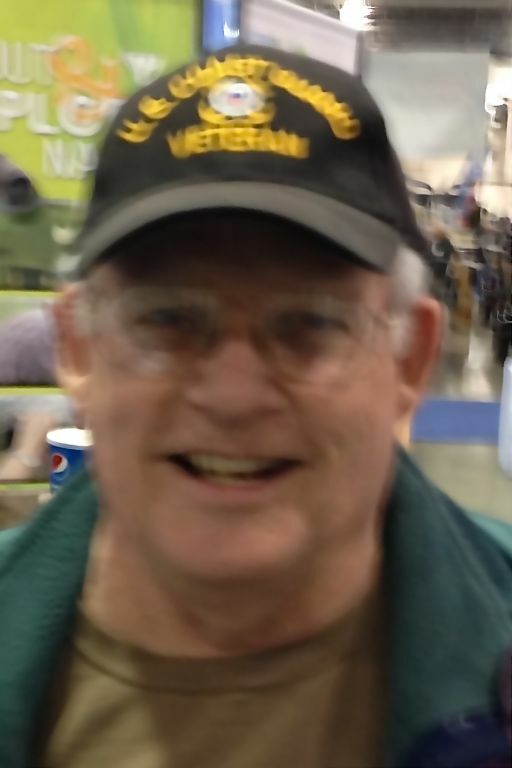 I want to thank you! We got a MuckMat Pro from you last year. My grandkids just love it! I thank you, because ever since we bought our cottage in 1982, we've never been able to swim off the dock. We always had to take the boat out to deep water to swim. I want to thank you for giving us our cottage back. They work great. I bought three of them last year and they are Outstanding. I don't sink, and the kids and my dogs love it. I blow 'em off [clean off silt] with the waver runner. It works great. We've had our MuckMat for three years now. It's absolutely great. The kids can go and play in our beach now. They'd never go out there before, they didn't like the muck and weeds. To clean it, I just rake it off with a plastic rake. The weeds don't grow and the kids don't sink. We really get to use our lakefront now. The MuckMat Pro works great and does exactly what it's suppose to do. We bought two of them. We have no weeds and we walk out on it with no problem. You can turn a swamp into a nice beach. They're awesome. 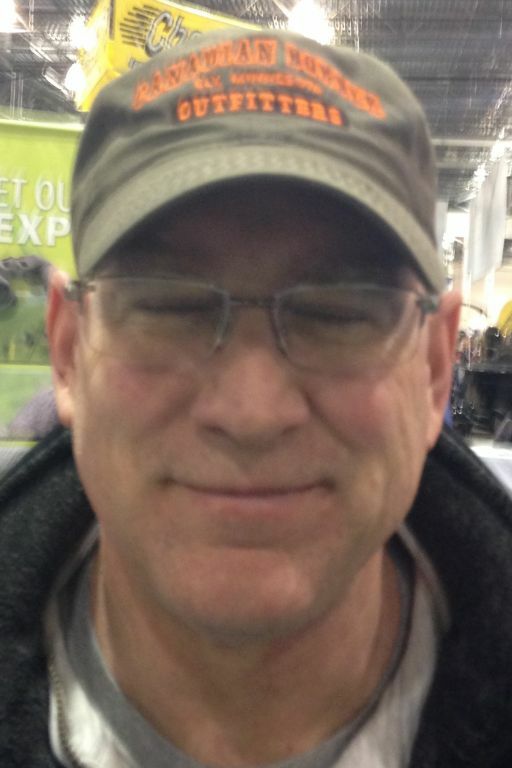 I was really happy with them. We bought three and I was able to walk them in just like your video. There are no weeds and we don't sink. That's why I'm getting two more MuckMat Pros. Just wanted to let you know that our 'muck mat' works exactly as advertised. I was dubious it would hold up, but after a year in the water it's still in perfect shape. It's been very easy to clean off and move around and is 100% effective for preventing lake grass and water lilies and simultaneously giving us a very comfortable surface to walk around. No more fear of blood suckers or getting our feet stuck in mud -- my wife and daughters will get in the water now with no complaint! It worked so well we're going to be getting the XL also! I have no reservations and am 100% satisfied! I just want to let you know this is our second muck mat and we were very happy with it .That's why when we moved to another location we bought another one . 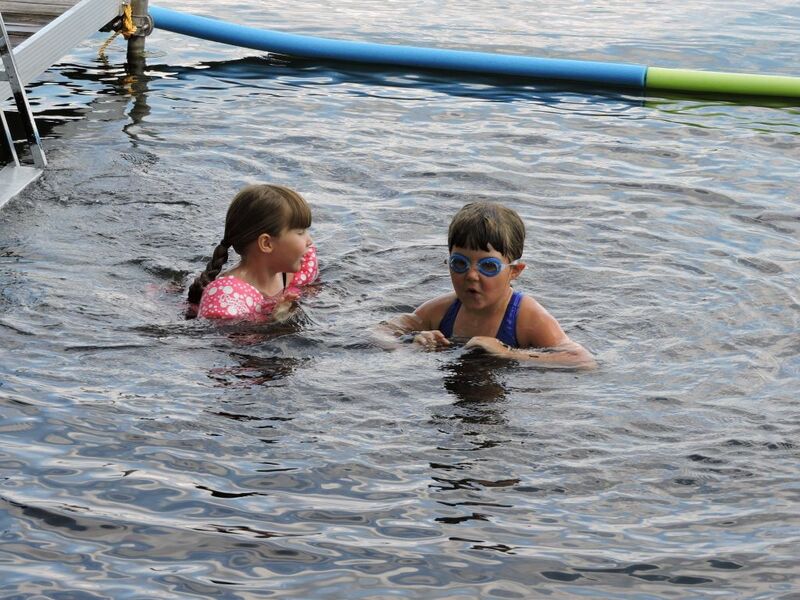 This is a great product and we are very pleased now we can swim in the lake off the shore with out sinking up to our knees and the kids can play safely. My dock goes out 30 feet from the shore line and at that point is almost 5 feet deep with muck up to my knees so the water level comes up almost to my chin. I put one matt on either side of my dock and put in such that the end of the matt is 3 feet beyond the end of the dock or the blue and yellow noodles. In the one picture my daughter is standing on the matt, without that matt the water would have been up above her waste with muck at least mid-cafe. In any event my 4 and 6 year grand daughters love jumping in time after time after time after time- you get the point. I leave the mats in all winter with a few extra patio stones placed here and there then I remove the stones in the spring. I also have a weighted push broom that works real well at removing sand and muck that gets washed up. Again thank you very much - I wish I had bought them sooner.